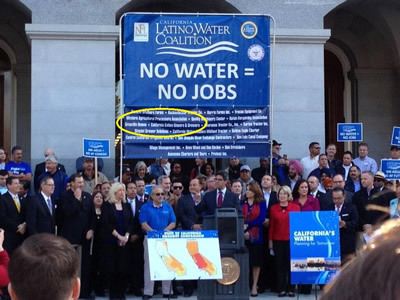 As part of our efforts on water, the CCGGA participated in and helped sponsor a huge water rally this week at the State Capitol in Sacramento. The Association’s Director of Regulatory Affairs Aimee Brooks led the Association’s efforts in Sacramento where over 1,000 supporters joined with a bipartisan group of legislators calling for the governor to declare a drought emergency, and to encourage passage of the water bond and for more storage. Buses from all over the state descended upon the Capitol where chants rallied for immediate action on water, including supporting the passage of the Water Bond on the 2014 Election Ballot. Supporters then entered the Capitol where they knocked on legislator’s doors pleading them to hear their story and discuss why this issue is so critical to jobs, families, and local economies. Just one day after the rally, the governor has declared an emergency drought which will provide minimal and temporary relief by loosening restrictions on water transfers among other limited administrative powers the governor can initiate. In addition to these changes, the declaration serves as an important public relations tool to draw the attention of the federal government, who could help with relief efforts. More updates regarding the implications of the emergency drought declaration will be coming soon!